Barbara Simpson has lived in the Grier Heights neighborhood for more than 66 years and has witnessed first-hand all of the changes in the neighborhood - both good and bad. She’s been a driving force behind the many improvements that have come to Grier Heights and continues to help the neighborhood and surrounding community. Barbara and I have become friends over the years. We’ve worked together on several projects in Grier Heights. Her dedication to this community is inspiring. 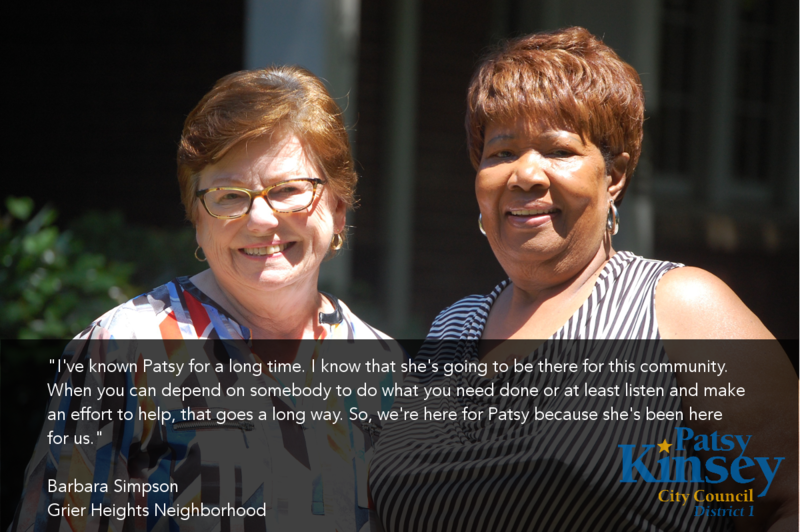 I am humbled by her love for and service to her neighbors and am honored to have her endorsement. I’ve known Patsy for a long time. We’ve become friends. If I need someone to talk to about something going on in the neighborhood, I can call her. I know that she’s going to be there for this community. I’ve called other elected officials and they’ll get back to you, but they don’t always do it in a timely manner. And, that makes a difference. When you can depend on somebody to do what you need done or at least listen and make an effort to help you it goes a long way. So, we’re here for Patsy because she’s been here for us. We’re looking forward to her running this year and we’re looking forward to her winning because we’re going to be there to make sure.